ViSound ... creating an ambience. Villeroy & Boch’s innovative ViSound system ensures a top-quality audio experience in the bathroom. From relaxing ambient sounds to the latest hits, the ViSound transforms the bath into a sound box. The new ViSound system consists of four powerful structure-borne sound converters which use the bathtub – either full or empty – as a resonance chamber. Two tweeters and two woofers ensure top-quality sound across the entire frequency range. The system also includes a receiver to playback multimedia files from Bluetooth-enabled devices such as a smartphone or tablet computer – all combining to create an exceptional sound experience which can not only be heard but also felt gently resonating in the water. 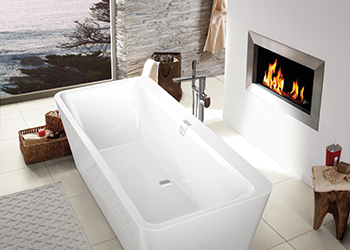 ViSound is compatible with all Villeroy & Boch Quaryl and acrylic baths and all whirlpool tubs. The sound system is delivered ready for connection, allowing the plumber to install it in just five to 10 minutes when fitting the bath. It is concealed in the body of the bath, with the splash-proof junction box, which operates safely even in wet rooms, connected to the domestic electrical supply. ViSound is easy to set up and operate by enabling the Bluetooth feature on one’s device, searching for ViSound and selecting Villeroy & Boch 2. Smartphones or tablet computers can then be used to control playback and volume of music, audio books, films or videos. 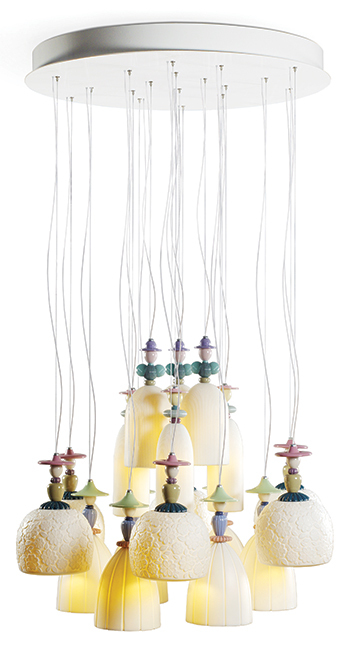 A chandelier from the Mademoiselle collection. Spanish luxury brand Lladro has introduced a range of handmade porcelain lamps, each of which contains a story sprinkled within a broad spectrum of colours. The range includes Mademoiselle collection, where Lladro’s elegant ladies have been turned into lamps, reinterpreting the brand’s iconic ladies in an exciting new and colourful language. This has four individual hanging lamps and three chandeliers with nine, 18 and 25 lights. In all the lamps, light is filtered through the translucent porcelain of the vaporous skirts of these ladies of light, projecting the decorative pattern etched on the surface of the porcelain. Another series is the Winter Palace collection, which includes a chandelier that seems to be taken directly from the palace of the Russian tsars or the Versailles palace itself. Created by the brand’s in-house team of designers, this ceiling lamp is a sophisticated model updating the classic chandeliers. It is available in six, 12 and 30 lights and in white and in white and gold finishes. The Belle de Nuit collection is a series of hanging, wall, standing, and tabletop lamps in different sizes and vibrant colours. The most spectacular model of all is the hanging lamp, an updated version of classic crystal chandeliers. Lladro has also expanded the Niagara chandeliers series with new models decorated with golden lustre. These striking chandeliers are composed of porcelain fairies hanging from fibre optic threads in a cascade of subtle points of light to create a brilliant effect. Steelcase has launched FrameFour, a new family of products including a desk, bench as well as conference and collaboration tables designed to provide workers with more choice and control in today’s offices. Part of the range is the innovative storage leg which serves as a personal storage unit and power source for multiple electrical devices. The launch follows a Global Report by Steelcase and Ipsos on worker engagement and workplaces. According to the report, only half of the employees globally (51 per cent) can choose where to work in the office based on the task at hand. It also showed that a distinguishing characteristic of engaged employees is that they have a greater degree of control over where and how they work, including access to privacy when they need it. They are empowered, both by organisational decisions and the spaces made available to them. “We know that employees who have the ability to shape their work experience are more satisfied and therefore more engaged as 88 per cent of the highly engaged workers in our survey have this option,” says Andy Morris, head of sales, Middle East, Steelcase. 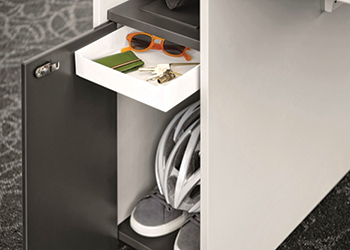 In addition to innovative storage leg, a personal locker to safely store belongings and power access for up to three devices, FrameFour’s features include the option to choose from more than 30 different melamine colours.